This lithograph is taken from plate 15 of 'Afghaunistan' by Lieutenant James Rattray. Mohammad Naib Sharif was a Shia chieftain from the powerful Qizilbash tribe originally from Iran. Other Afghans were mostly Sunni Muslims and Rattray wrote: "This difference in their religious tenets creates the bitterest feeling between the two sects and leads to constant bloodshed." 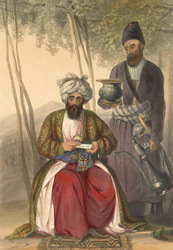 Sharif was a close friend of Alexander Burnes and had rescued Burnes' dishonoured corpse and given it a decent burial. He compromised himself so much due to his steadfast friendship with the British that he was constantly threatened with destruction. He left Afghanistan with the British armies in 1842 and was given a handsome stipend by the Indian Government. His Peshkhidmat - or attendant - wears the black lambskin cap of the Iranians. Through the opening at the top peeps the red lining, like a tongue, from which the term Qizilbash, meaning red cap, is derived.